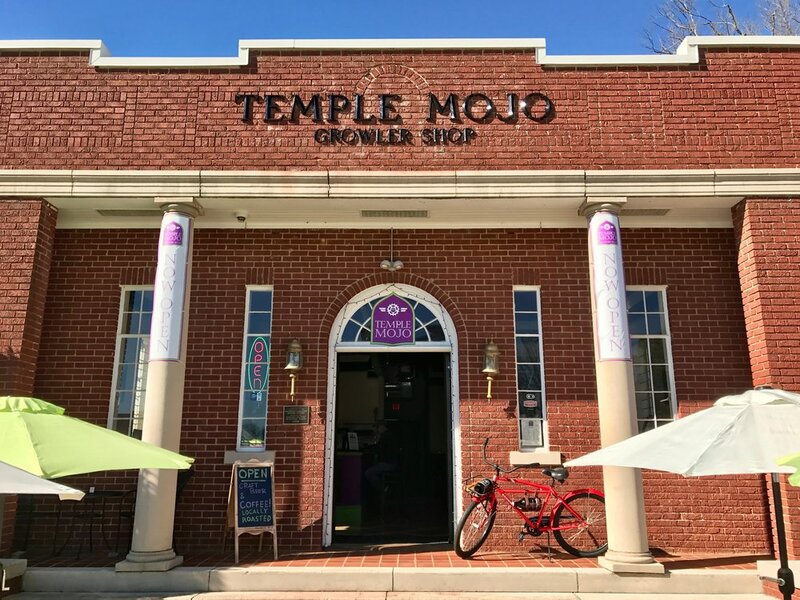 Temple Mojo Growler Shop in the heart of downtown Matthews and has become the go-to spot to get your growler fills and pints of local craft beer and cider as well as wine by the glass. We feature beers and ciders that are usually unavailable to buy in bottles or cans. But you can take these products home with our growler fills. Temple Mojo Growler Shop is a bicycle themed taproom with bike decor and even displays of bikes that are for sale at Mojo Cycles located directly behind Temple Mojo Growler Shop. It's an atmosphere that is laid back and fun. At Temple Mojo Growler Shop we have 26 taps to choose from! Our entire tap list is available to enjoy on-site in our tap room or to take home in a growler. You can visit Taphunter at any time online or via their mobile app to view our tap list. We update Taphunter daily, so the menu you see online always represents what you can find in our taproom. Temple Mojo Growler shop also features locally roasted coffee from Cow Hollow Coffee. We feature espresso drinks like cappuccino, lattes, mochas, and shots of espresso along with just a regular cup of coffee (Cup of Mo/Joe).